This three volume reference series provides an authoritative and comprehensive set of volumes collecting together the most influential articles and papers on tourism, heritage and culture. The papers have been selected and introduced by Dallen Timothy, one of the leading international scholars in tourism research. 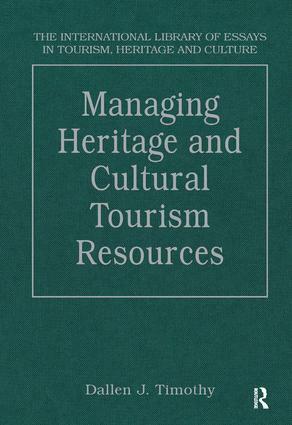 The first volume 'Managing Heritage and Cultural Tourism Resources' deals primarily with issues of conservation, interpretation, impacts of tourism and the management of those impacts. Sold individually and as a set, this series will prove an essential reference work for scholars and students in geography, tourism and heritage studies, cultural studies and beyond.